Novermber is often the last month for our garden club. Winter is nearly here, and we need a break for a while to make new plans for Spring. 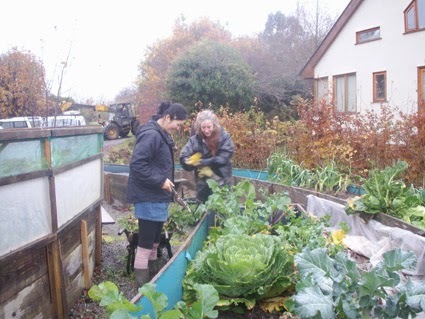 It was another rainy day, nothing unusual for November in Ireland, but our garden club was surely on. 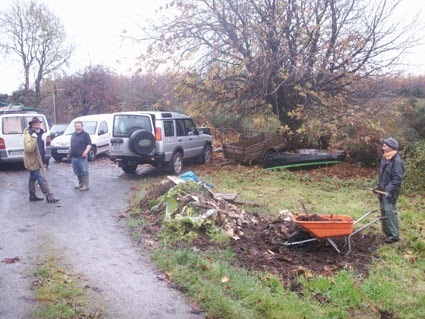 Our hardy friends and neighbours came to work for Tommy and Anita's garden in Magherabaun. 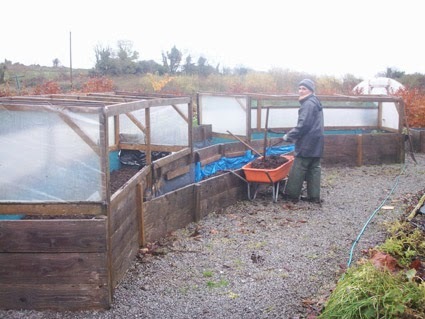 Somehow it's always men's work to turn compost. Maybe that's what they're interested in more than weeding. 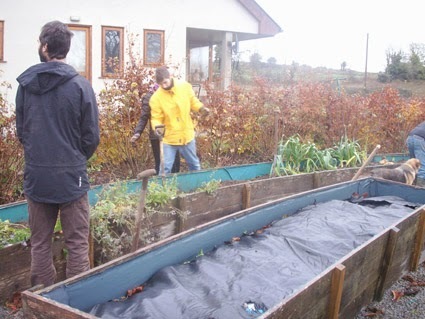 Here are the reliable gentlemen gathering up at the compost. 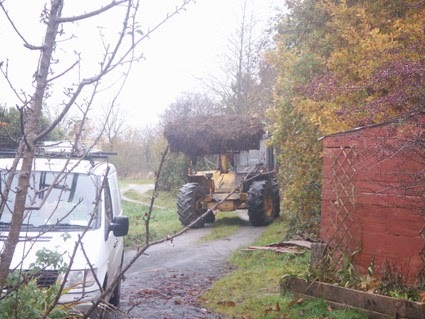 Harrie came to the garden club today with his teleporter, bringing a wonderful present for Tommy and Anita.. top quality organic manure from his farm. 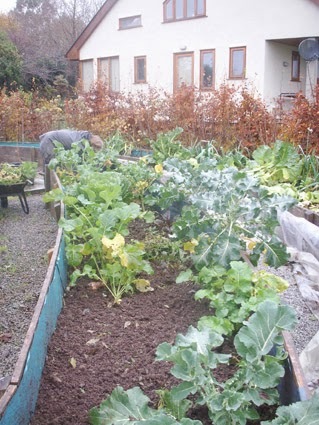 The manure was well mixed with compost later on and looked really good. 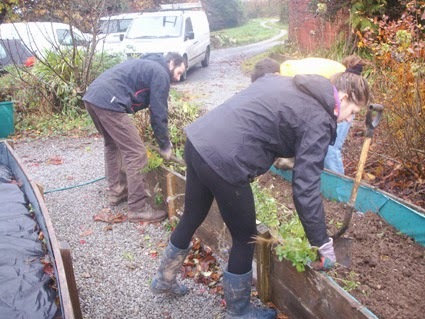 Today's work is mainly weeding, which seems to be the most popular work for our garden club. You might get sick of weeding your garden on your own but you'd be amazed how much you can enjoy it when you have good company. We haven't seen this woman in our blog before. That's because I'm the photo taker and have been writing this blog since. 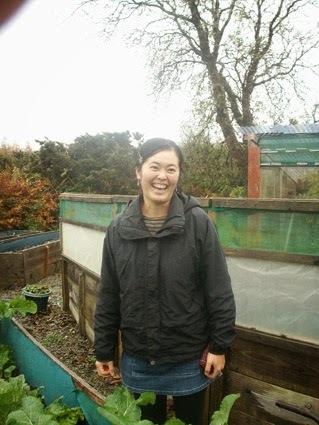 Frank kindly offered to take this photo of me, thanks Frank. Their garden beds are all highly raised up. It's a great way of having it so that you don't bend your back all the time. Also there's less attraction for slugs to come in. All is good. Saul's 2 woofers from Italy came along with him to work with us. It must have been some experience for them to be outside, working in the rain for 3 hours...! Well done. 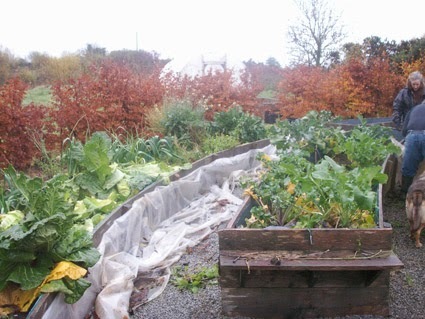 The beds would be covered with cardboard until next Spring so that no weed would come up. 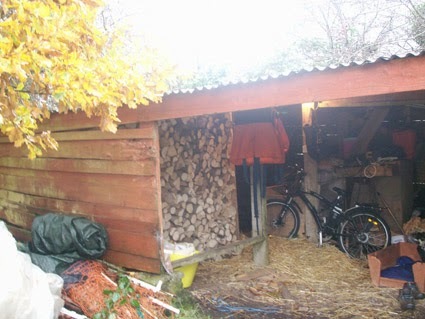 Tommy's shed looks lovely with timber for heating. He's very proud to be able to heat their house with the wood from their own land. Tommy and Anita's garden is full of smart and unique ideas. This bed has a timber frame above it with plastic sheet all around. 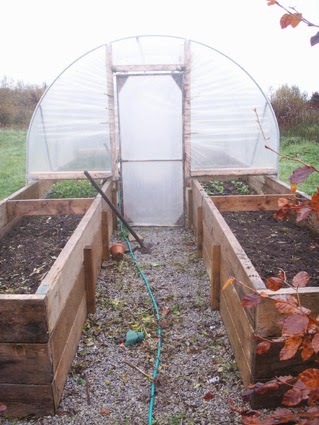 It's like a polytunnel or cloche. Hand made glass house is a brilliant thing to have. This timber framed glass house is made with old windows, plastic and corrugated clear roof. 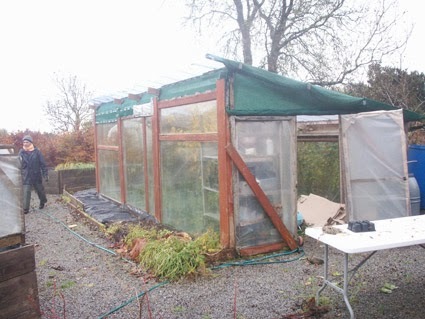 If you're a handy person and have a bit of time, you can make your own glass house instead of buying a commercial one. Even their small tunnel is the most unusual. 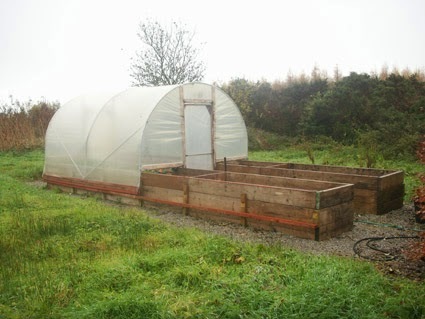 The tunnel slides over the two raised beds. I've never seen anything like it before...! 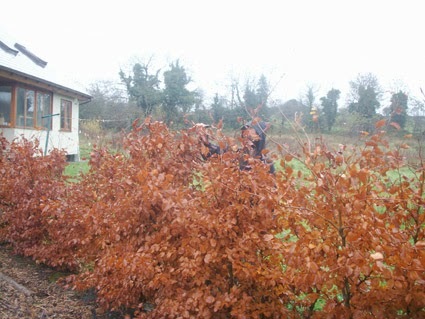 Saul is clipping the beech hedges to make it tidy. He is the right man for the job! It was nearly 1 o'clock and we couldn't wait to go inside. Anita's homemade leek and potato soup was there to welcome us. 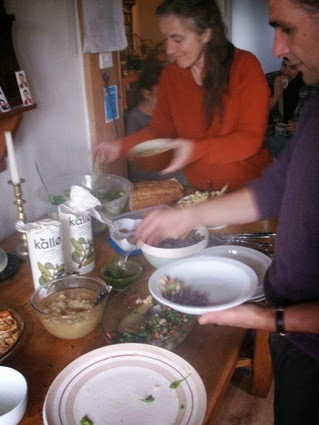 We had lovely lunch as usual, you really feel gardening and cooking are strongly connected to each other. There's nothing tastier than your own food. That's it for now and we're going to have a lunch party next December. I might update this blog for one more time then. See you soon and thank you all for reading it.